Not every emergency requires an evacuation, but having a clear procedure for removing people from danger is a core element of any workplace emergency plan. Even if an accident emergency is confined to a specific area, staff and visitors will need to be removed swiftly and without delay, and to accomplish this, people need to know where to go immediately. Of course, a PCBU, first aider or other appointed member of staff needs to be well versed in any evacuation procedure, so that instruction can be given to the people present. However, it is equally a good idea that all workers – whether on the shop floor or in the administration office – know where to go. Clearly, office staff need a different evacuation route to those in the warehouse, for example. Knowing how to reach a safe area from each individual work area is vital. It is also important that more than one evacuation route is selected from each work area. This is because the emergency itself might mean that Route A is blocked, so a Route B and even a Route C may be necessary. 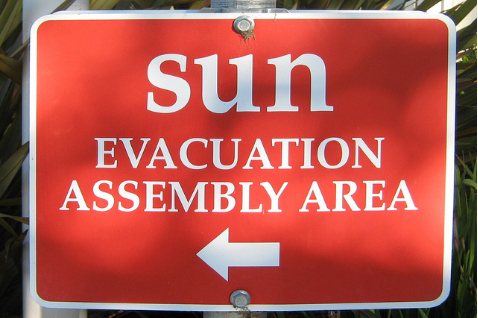 When drawing up the evacuation plan, all possible scenarios should be examined. Also, and perhaps most importantly, providing proper training to relevant staff is hugely important. First aiders and PCBUs are often those chosen, but whoever it is must know immediately how to oversee the evacuation procedure, calmly provide instruction and be fully aware of alternative options if needed and be able to communicate them to evacuating staff. This is where simulations and practice evacuations are so valuable. Running a simulated evacuation on a quarterly basis helps ensure that everyone is clear on what must be done and what route to take. Time is very important especially when it is between life and death. With Alsco we can supply your business with a managed Automated External Defibrillator (AED) service to ensure you have access to a high quality, affordable Automated External Defibrillator at all times. We also offer fully managed First Aid Supply and Service Kit designed to ensure ongoing WH&S compliance for your business. Make your own workplace safer. Give Alsco a call. What are you waiting for?